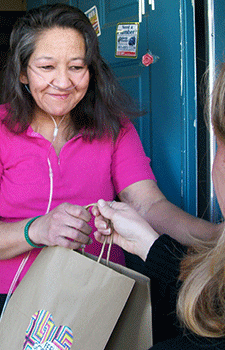 Since 2005, Project Angel Heart has worked to ensure that Colorado Springs-area residents coping with life-threatening illnesses like cancer, HIV/AIDS, and kidney/heart/lung disease have access to vital nutrition by providing home-delivered meals specifically modified to meet their unique dietary needs. In 2019, we expect to deliver nutritious, life-saving meals to more than 600 individuals in El Paso County. There are no age or income restrictions to qualify for this service, and meals are delivered free of charge. We also provide meals for dependents of eligible clients to minimize the impact of life-threatening illness on families. Our ability to customize meals and serve individuals regardless of age or income makes our service unique. Volunteer orientation can be scheduled at your convenience. Please register and come learn about meal delivery, bag decoration, event assistance, and office help. Open Monday-Saturday, hours vary. Please call ahead at 719.323.0084. For more information about receiving meals in Colorado Springs, please contact our client services team at 1.800.381.5612. For volunteer, donor, and other inquiries about our program in Colorado Springs, please call our Colorado Springs office at 719.323.0084.